NEW! 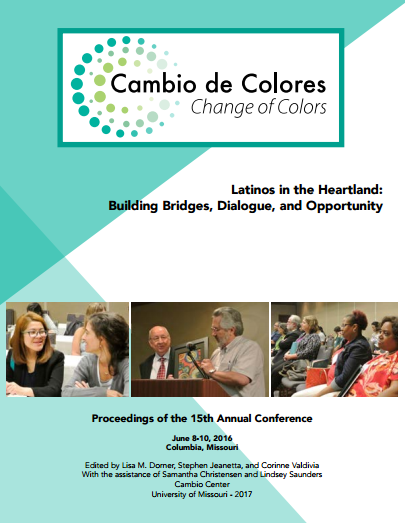 Book of Proceedings of the 2017 Cambio de Colores conference. NEW! Selected papers from the Cambio de Colores proceedings can be searched in the digital library hosted at MOSpace. This page includes only publications originated in the Cambio Center research and outreach work. 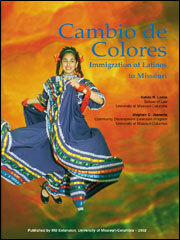 Cambio de Colores resources can be searched in the Cambio Center digital library. 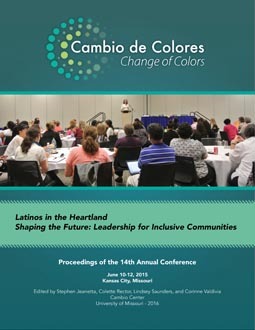 Publications & Presentations of the 4-year project "Immigrant Integration and Sustainable Rural Development: Linking Receiving and Newcomer Communities"
Articles & Presentations of the 4-year project "Asset Accumulation Strategies in Three Settlement Communities in Missouri"
Cambio de Colores - Latinos in Missouri. 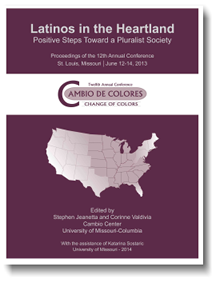 Cambio de Colores Conference Abstracts. 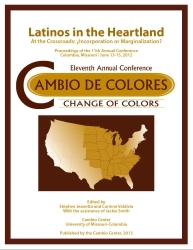 Latinos in Missouri: Beyond Borders, 2006. Latinos in Missouri: Everyone Together—Todos Juntos, 2007. 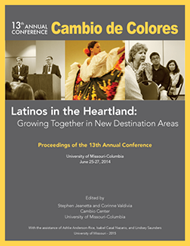 Latinos in Missouri: Uniting Cultures—Uniendo Culturas, 2008. Cambio de Colores. Latinos in Missouri: Gateway to a New Community. Proceedings of the 2004 annual conference including selected papers from 2003. 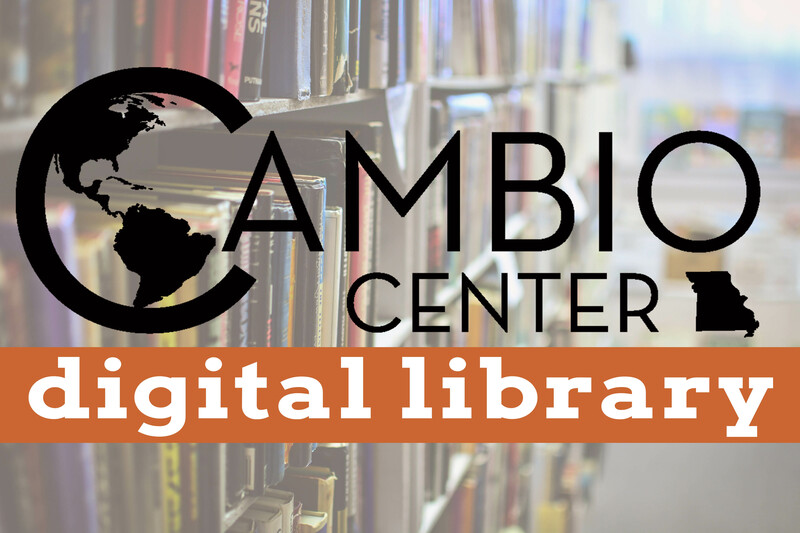 Cambio eBriefs are short introductions to our fellows' research topics for a general audience. They seek to connect our communities to the research findings and initiatives of university researchers and their colleagues. Corinne Valdivia, Stephen Jeanetta, Lisa Y. Flores, Alejandro Morales and Domingo Martínez: "Latino/a Wealth and Livelihood Strategies in Rural Midwestern Communities." Choices. The magazine of Food, Farm, and Resource Issues. 1st quarter, 2012. (Full text). Valdivia, Corinne, and Lisa Y. Flores. 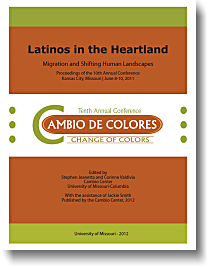 "Factors Affecting the Job Satisfaction of Latino/a Immigrants in the Midwest." Journal of Career Development. February 2012 39: 31-49. DOI: 10.1177/0894845310386478. (Abstract / Full Text (PDF). Jeanetta, S., Dannerbeck, A., Valdivia, C. & Flores, L. "Integration and Wellbeing: Using Photovoice to Engage Latino Immigrants in Understanding Community Climate." International Journal of Qualitative Methods (Accepted 9/9/10). Corinne Valdivia and Anne Dannerbeck Janku: "Moving around to get by and try to get ahead: Immigration experiences in new settlement communities of the Midwest," Professional Development: The International Journal of Continuing Social Work Education, Vol. 12, No 3, Winter 2009 (pp. 29-41). Abstract and references. Full article available from the publisher. Presented in a principal paper session at the 2008 AAEA annual meeting Orlando, FL. This project is supported by National Research Initiative Grant No. 2006-35401-17429 from the USDA Cooperative State Research, Education, and Extension Service Rural Development Program. Valdivia, Corinne, Pedro Dozi and Emma Zapata Martelo, "Migration To Rural Communities In The Midwest: Economic Wellbeing And Women At The Household Level." University of Missouri, Department of Agricultural Economics Working Paper No. AEWP 2007-01, January 2007. "Conozca sus derechos" - A 20-page educational brochure of the Office of the Attorney General of the State of Missouri has been released (December 2005). The translation of the "Know Your Rights" publication is a contribution of the University of Missouri through the Cambio Center. ESPAÑOL: "Conozca sus derechos" es un folleto educacional gratuito de la Oficina del Procurador General del estado de Missouri, publicado en diciembre del 2005. La versión en castellano es una contribución de la Universidad de Missouri hecha posible por el Cambio Center. Green, John J., and Elizabeth Barham. 2002. Globalization and Latino Labor: Labor Advocates' Accounts of Meatpacking in Rural Missouri. Henness, Steven A. 2002. Latino Immigration and Meatpacking in the Rural Midwest: An Inventory of Community Impacts and Responses. Thomas, Roderick H. 2002. Exploring Double Consciousness Within the Hispanic Male Community. Whiting, Erin Feinauer. 2002. Immigration, Mobility and Community in a Global World.